#7253 - c. 1978 RAQUEL WELCH Royal Blue Sequined Catsuit by LORIS AZZARO Worn to the 1978 Oscar Awards! 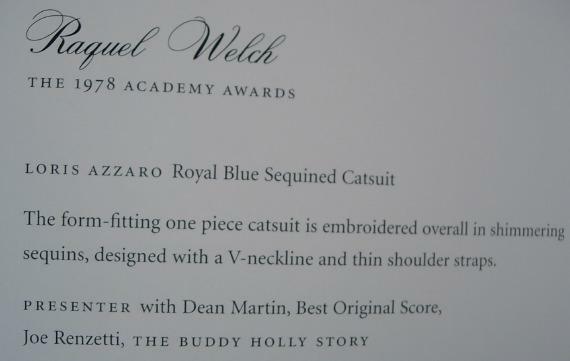 The story behind the Raquel catsuit is that Raquel had to really squeeze into the outfit and it was so tight that she had to lay down in the limo on the way to the Academy Awards show because she was afraid that if she sat in it she would split the seams open! Now that's a story! :) And from the photos, it certainly seems to be true. 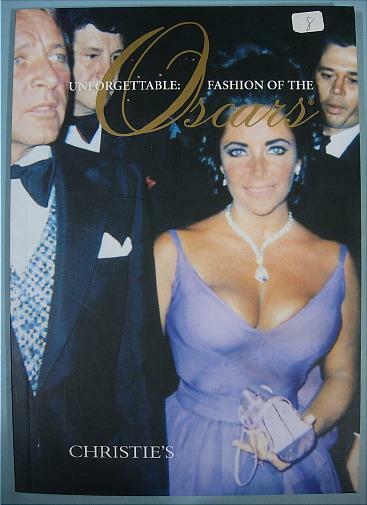 Sold back in 1999 at the world renowned Christie's auction house at their exciting "Unforgettable Fashions of the Oscars" auction. I was lucky enough to recently acquire this piece as well as the Scaasi gown worn by Mitzi Gaynor (see below). Sorry to all my customers that this sold as fast as it did, but who can resist posting these gorgeous photos of Raquel!